It may be time to buy quality defensive stocks with strong balance sheets and now on lower valuations. In recent years, the performance of growth stocks such as technology, consumer discretionary, materials and industrials has eclipsed the rest of the equity market. In fact, growth sectors have outperformed their defensive counterparts, including consumer staples, telecoms, healthcare and utilities, by 40% since the start of the bull run in 2009. But as we enter a more dangerous part of the investment cycle, an emphasis on quality defensive stocks with strong balance sheets and business models makes sense, not least to take advantage of the current lower valuations in sectors such as consumer staples. Growth stocks are also more likely to suffer from the withdrawal of central bank liquidity, as they tend to be younger companies carrying debt sensitive to rising interest rates. "We believe current investment positioning should very much reflect the fact that we are now getting towards the end of the cycle and the risks are increasing as a result," says Rupert Thompson, head of research at KW Wealth. "Portfolios should be positioned so that they have some protection against the more serious downturn which looks all but inevitable over the next couple of years, while retaining exposure to sectors and themes that can be expected to outperform over the longer term." The US economy has now been booming for the second-longest continuous period in history and the equity market will beat all records if it survives until May. However, while US company profits grew by around 25% in 2018, they are now beginning to wane, and the benefits from the US tax cuts implemented in 2017 are also starting to fade. The good news for investors is that the US Congressional gridlock created by the November mid-term elections, which has the Democrats controlling the House of Representatives and the Republicans maintaining a Senate majority, makes it more difficult for either party to push through extreme legislation. That is positive for the politically sensitive healthcare, technology and infrastructure sectors. The US healthcare market is the largest market for pharma and biotech companies and has a disproportionate influence on these industries. Healthcare is the number one issue for the Democrats, who devoted half of all their campaign adverts to the topic; they have been edging towards universal healthcare and increased regulation of drug prices. A top priority for the Democrats in the House of Representatives is to control prescription drug pricing, and Donald Trump has said this is an area where he can work with them. He has already proposed requiring drug companies to include the list prices of their products in TV adverts, and to reduce Medicare payments for expensive treatments by using their average cost in other countries as a benchmark. The new political status quo reduces the risk of disruptive, government-dictated pricing changes for at least the next two years. The biotech universe also offers tremendous promise with a similarly benign regulatory environment, low valuations, continued M&A activity and exciting development opportunities. Grant Challis, Partner at Frostrow Capital, goes so far as to say that "the golden era for innovation is in motion, with the sector poised for significant breakthroughs in gene therapy, gene silencing, Cart-T and Alzheimer's". The rise of populist parties around the world is also set to boost infrastructure spending, as governments roll back their austerity programmes. Trump, for example, has promised a major programme of infrastructure investment. "Ironically, the shift in favour of the Democrats in the House of Representatives following the mid-terms may make this part of his programme more viable, since the main opposition to such a programme has come from fiscal hawks in the Republican Party," says Jason Hollands, managing director of business development at Tilney. "The Democrats, however, have been advocating their own $1 trillion infrastructure programme, so this could be an area with scope for a bi-partisan agreement." "The areas of most need at home and abroad are transport infrastructure, especially roads, which needs replacement and expansion; energy generation and distribution; and improvements in the coverage of high-speed internet networks," explains Richard Parfect, fund manager at Seneca Investment Managers. "Certain parts of the world – not least the US – also suffer from insufficient water infrastructure." It might be sensible to swerve demand-based assets, such as toll roads, whose profitability is linked to the economy. Rising interest rates also have a detrimental effect on the sector, but the very cause of rising interest rates is the inflationary pressures building around the world, and as infrastructure assets often have contracted revenues linked to the level of inflation, there is a natural hedge between these two factors. Yet, as long as interest rates are still low by historical standards, assets with a proven operating history may be able to refinance their capital base, probably at a lower cost of capital. Several infrastructure teams have made announcements along these lines. The technology sector, which is dominated by the FAANG stocks and giants such as Alibaba (NYSE:BABA) and Tencent (XETRA:NNN1) in Asia, has been much in the news, with aggressive markdowns in October and increased scrutiny from politicians and regulators, particularly in relation to data management in the wake of the Cambridge Analytica scandal. The US-China trade dispute is also creating uncertainty about global supply chains for components. Nonetheless, earnings estimates for the sector are very strong for 2019 and 2020, especially for hardware companies, which actually had a tough 2018; and the sector could be set for another record year for share buybacks. Scrutiny on data, taxation and content will inevitably soak up some of the resources of big tech, and that may curb profit growth, but these are typically companies with deep pockets and enviable positions in their markets. Comparisons are often drawn with the dotcom bubble, which ended in tears, but in most cases today's tech titans have a lot more going for them in terms of products, services and resources than the blue-sky tech names of the late 1990s. Fintech is also coming of age as a separate sector, including electronic payment services and core systems to replace outmoded bank legacy systems. This is a large and growing sector with plenty of promising IPOs next year. For the financial sector, a rising interest rate environment is normally supportive, enabling banks to expand their margins on lending activity. UK banks in particular could be set to bounce as they are well-capitalised, and profitable, but their share prices have been depressed by Brexit. The future could be less rosy for asset managers and life companies, however, as they are a geared play on markets and so growing investor cautiousness about the demise of the bull market could hold them back. In the tech sector, standard tech ETFs such as iShares S&P 500 Information Technology Sector ETF (LSE:IITU) are heavily weighted to the giant firms, which are mature and may also have a mixed bag of interests. The biggest holdings in the S&P 500 Information Technology index are Apple (NASDAQ:AAPL), NVIDIA (NASDAQ:NVDA), Microsoft (NASDAQ:MSFT), Micron Technology (NASDAQ:MU), Intel (NASDAQ:INTC), Qualcomm (NASDAQ:QCOM) and Cisco Systems (NASDAQ:CSCO), which typically are entering bear territory. In January db x-trackers will launch a tech ETF more thoughtfully constructed to include only companies that make most of their revenues out of tech, and where tech is central to strategy. There are many tech ETFs with interesting slants, but they are mainly listed in the US. For example, Invesco S&P 500 Equal Weight Technology ETF offers equal-weight exposure to 67 tech firms; PowerShares S&P SmallCap Information Technology Portfolio tracks a wide number of smaller-cap tech stocks, while SPDR S&P Internet ETF is 40% exposed to internet and direct marketing retail. GinsGlobal Index Funds has recently launched the London-listed HAN-GINS Innovative Technologies ETF (LSE:ITEK), which tracks companies in the robotics and automation, cloud computing and big data, cyber security, future cars, genomics, social media, virtual reality and blockchain industries, and HAN-GINS Cloud Technology ETF (LSE:SKYP), which covers cloud-based so ware and services. Global X Internet of Things Thematic ETF, meanwhile, tracks the Indxx Global Internet of Things Thematic Index and is concentrated in around 50 stocks. For global infrastructure exposure, there are the iShares Global Infrastructure ETF (LSE:INFR), db X-trackers S&P Global Infrastructure and SPDR Morningstar Multi-Asset Global Infrastructure ETF (LSE:GIN); the latter also invests in bonds issued by infrastructure companies. 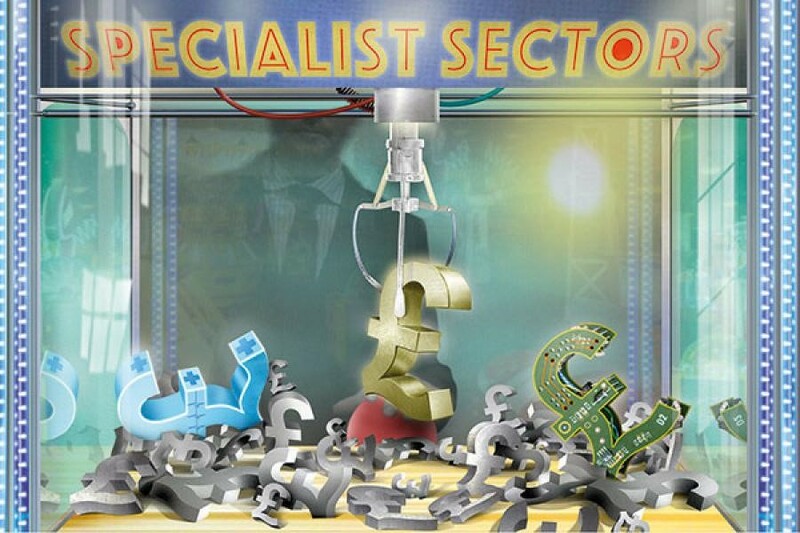 In the financial sector, SPDR S&P US Financials Select Sector ETF (LSE:SXLF) offers exposure to large ¬financial ¬firms, but at a juncture like this, where volatility and risk is heightened, it may be a sensible idea to employ active managers to avoid the laggards and duds.